This morning’s exercise in “there’s a couple hours I’ll never get back”: A list of (some) of the world’s tallest flagpoles. An inquiry prompted by driving through Dorris, California (see last night’s post). Of course, the list is non-authoritative, because it’s based on Web resources; on the other hand, in most cases, someone who should know is cited as giving the height of these flagpoles and I’ve cited sources, both strong and not so strong. Also note that the No. 1 flagpole, the one in Panmunjom, North Korea is not really a flagpole at all but a structure that supports a flagpole at the top; it’s noted in several places that North Korea and South Korea have been engaged in a contest of “can you top this,” and that the North has raised the height of its tower more than once. 3. Amman, Jordan: 416 feet (Source: Middle East Online; height also given as 410 feet by manufacturer). We were gone 51 hours. Drove 1,035.3 miles. Left Eugene today at 1:51 p.m. and got home (514 miles later) at 10:34 p.m. Stops in Weed, Redding, and Williams. 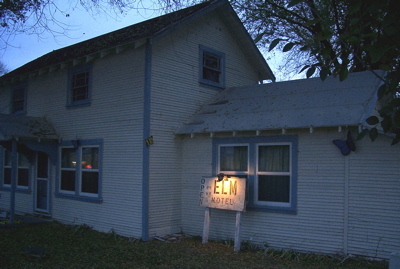 And in Dorris, California, too, to snap a picture of the Elm Motel (see below). 5:03 p.m.: Dorris is the first town you hit in California as you head south from Klamath Falls on U.S. 97. The highway makes several turns in town. This place is just south of the last bend, and just across the street from the big restaurant in town, a divey-looking place called La Tapatia. In addition to these two establishments, Dorris (population in 2000: 886) boasts that it’s the home of the tallest flagpole west of the Mississippi. Whether the claim is true or not (and I can’t find anything right now that contradicts it — stay tuned), the flagpole is an eyecatcher. 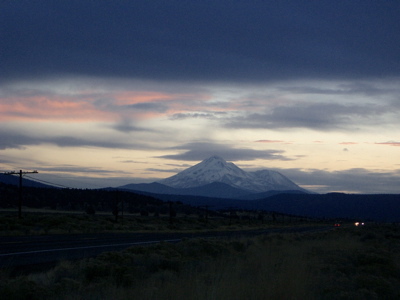 5:11 p.m.: You could see Mount Shasta for well over 100 miles to the north along U.S. 97 today, despite partial overcast. This is from closer up — it was probably about 45 miles to the northeast of the mountain and just a few miles southwest of Dorris and the warm welcome waiting northbound travelers at the Elm Motel. 7:13 p.m. At the In-N-Out in Redding. 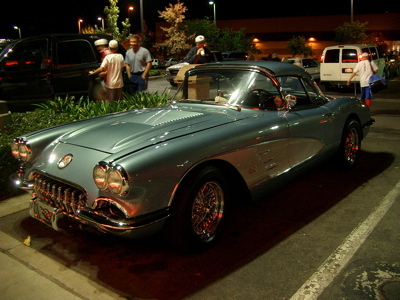 There were two Vettes parked just outside. This was the nicer one and the better picture. I’m writing from Eugene. Kate and I are on a quick jaunt up to see Thom. We’ve got an extra hour of sleep tonight, thanks to the end of daylight saving time. And tomorrow, an hour less afternoon light on the trip home. That’s OK. I’ll take the extra hour of sleep. Let it be noted that after next year, the appointed dates for falling back (and springing ahead) will be changed as part of the new energy law passed and signed earlier this year. Beginning in 2007, clocks will be turned forward the second Sunday of March (instead of the first Sunday of April) and turned back on the first Sunday of November (instead of the last Sunday of October). “… For nearly half the year the sun shines upon the land for several hours each day while we are asleep, and is rapidly nearing the horizon, having already passed its western limit, when we reach home after the work of the day is over. Under the most favourable circumstances, there then remains only a brief spell of declining daylight in which to spend the short period of leisure at our disposal. He conceded that simply turning the clock ahead an hour might be a bit abrupt, and he thought a change of 80 minutes (instead of the 60 we’ve wound up with) would be more beneficial to society. So he suggested that at 2 a.m. on four consecutive Sunday mornings in April, clocks be turned ahead 20 minutes. The clock would be turned back again over four Sundays in September. Willett managed to attract the attention of a prominent member of Parliament who championed his idea, but bills to put it into effect went nowhere. Willett died in 1915. The following year, after noticing that its World War I opponent Germany had adopted a daylight-saving scheme of its own, Britain started using Willett’s system. (The history is well summarized at a site called WebExhibits. And a recently published book, “Seize the Daylight,” appears to tell Willett’s story at length; amazingly (I’m amazed, anyway), another book on the history of daylight saving was published the very same week: “Spring Forward: The Annual Madness of Daylight Saving“). Now, with 2 hours and 28 minutes to go before the clock runs backward, I’m going off to enjoy my extra hour of fall-back sleep. I’m happy to report that, contrary to no reports of which I’m aware, there’s no established historical link between White Sox World Series victories and severe hurricane seasons. This non-finding is the product of minutes of meticulous research. The White Sox won the World Series this year — last night, in fact, if reports are to be believed. At nearly the very same time as the Chisox went into their victory dance in Houston, the National Hurricane Center was reporting the emergence of the 23rd named tropical cyclone, Tropical Storm Beta, of the 2005 Atlantic tropical cyclone season. Could there be a correlation between the ecstasy on Chicago’s South Side and the agony throughout the Caribbean and Gulf basins? To answer that question scientifically, I typed “1917 hurricane season” into my conveniently located Google search box, located in the upper right of my Web browser. The choice of 1917 was not random. Rather, it is the widely reported year that the White Sox won their last World Series. A severe storm season that year might suggest a Hose-hurricane convergence. While these cyclones can never be said to be “a picnic,” in the meteorological sense, evidence indicates that the season that year was as carefree as they come, with just three storms reported and just one that hit the United States. I next searched for information on the 1906 hurricane season — which unfolded the year of the only other Sox triumph in the Series. The 1906 season was considered “average,” with 11 storms, six of which became hurricanes (and three of the hurricanes evolving into major, destructive storms). Conclusion — are you still with me? — The White Sox played no part in this year’s overactive hurricane season. Future inquiries might look at the coincidence of Sox championships and major earthquakes. They may not be my team, and I may never have set foot in their ill-begotten “new” ballpark, but the White Sox did something tonight that no Chicago ballclub, of either the National or American variety, has done since the first Mayor Daley was a teen on the South Side and getting ready to make his mark in the world as part of a street gang. I’ll skip that historical side trip, for now. Anyway, it’s a sweet moment in a vicarious way. The last time a Chicago team won three straight in a World Series before last night was 1907, when the Cubs swept the Tigers 4-zip in a five-game set (you could look it up). If the White Sox go on to win the championship — take nothing for granted, sports fans — the name of manager Ozzie Guillen will be forever joined to that of Pants Rowland. Sox cognoscenti — Lydell, I expect that’s you — will recognize the name of the South Side nine’s last title-winning manager. First, this is just more proof of the oft-lamented fact that the quality and color of baseball nicknames is in a sad state of decline. The ’17 Sox were loaded, moniker-wise. In addition to Pants, they had Shoeless Joe, Shano, Buck, Happy, Chick, Nemo, Swede, Ziggy, Birdie, Lefty, Red, Reb, and Knuckles. This year: Hmmm. They’ve got El Duque. And The (Non-Playing) Big Hurt. Other than that, a bunch of Dustins, A.J.s, Scotts and Jermaines — though mixed with non-nickname handles like Timo, Tadahito, Pablo and Raul that would never have been on a 1917 big league roster. But let’s get back to Pants. 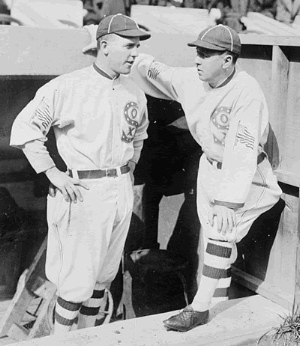 According to one online account, the tag dated from his Iowa boyhood: "Rowland started in baseball at age nine, where he earned his nickname, ‘pants,’ from base-running antics while wearing his father’s overalls at games of the Dubuque Ninth Street Blues." Eventually, he became a minor league manager in Peoria. Then, perhaps because his services came cheap, a quality highly valued by Sox owner Charles Comiskey, he wound up in Chicago for four years; he was bounced a year after winning the Series. After that, he became an American League umpire and later president of the Pacific Coast League. Given the high quality of PCL talent and the rapid growth of the league’s franchise cities, his dream, apparently, was to establish a new major league on the coast. He died in 1969, age 91, in Chicago. This Associated Press obit from The New York Times has the story. Both the subject and the way it’s handled are throwbacks. CBS News leads its 10 a.m. hourly radio news with Bush giving a speech to military wives. He’s got a comforting message for them: The road to “total victory” — his recently declared goal in Iraq — will be paved by “more sacrifice.” Let’s not dwell too long on who will make the sacrifice. The military wives already know. The sacrifice talk — Bush sounded the same theme in his weekly radio talk last Saturday — is prompted by the U.S. military death toll in Operation Mission Accomplished reaching 2,000 (along with 15,220 wounded). The other side to Bush’s talk about the need to stay the course, shed as much blood and spend as much money as it takes, is that each passing day shows the war in Iraq to be a more and more fabulous success. RAMADI, Iraq, Oct. 22 – The Bradley fighting vehicles moved slowly down this city’s main boulevard. Suddenly, a homemade bomb exploded, punching into one vehicle. Then another explosion hit, briefly lifting a second vehicle up onto its side before it dropped back down again. Two American soldiers climbed out of a hatch, the first with his pant leg on fire, and the other completely in flames. The first rolled over to help the other man, but when they touched, the first man also burst into flames. Insurgent gunfire began to pop. Several blocks away, Lance Cpl. Jeffrey Rosener, 20, from Minneapolis, watched the two men die from a lookout post at a Marine encampment. His heart reached out to them, but he could not. In Ramadi, Iraq’s most violent city, two blocks may as well be 10 miles. … Within minutes, four American contractors, all employees of the Halliburton subsidiary Kellog, Brown & Root, were dead. The jubilant crowd dragged their corpses through the street, chanting anti-US slogans. An investigation has been launched into why the contractors were not better protected. In most years, a storm of the relative inconsequence of Tropical Storm Alpha — it’s of little consequence unless you happen to live beyond blog reach in the mountains of Hispaniola, anyway — would barely have attracted public notice here in the States. But 2005 isn’t most years, and Alpha, which blew westward across the Atlantic for days while Hurricane Wilma got all the ink last week, finally became organized enough that it was officially recognized as a tropical cyclone. The history has been well discussed: It’s the first time since hurricane records have been kept in the mid-Atlantic/Caribbean/Gulf region that so many tropical cyclones have formed in one season: 22. But that’s a record that goes back just 150 years, a sliver of a sliver of time. Leaving aside the impact we’ve had on long-term climate as enthusiastic burners of anything that will burn, is it really likely that the weather observed this year is of absolutely unprecedented severity? Just asking the question tells you what I think. Maybe someday climate scientists, like those working in the new field of paleotempestology, will produce a definitive answer to open-ended questions like that. Alpha’s nearly done with. But Wilma’s still a story. Having read the discussions pretty religiously the last week or so, it has defied the model predictions (and thus our expectations) and restrengthened after crossing Florida. This is a boon for researchers looking for clues to storm behavior, no doubt. It’s also a treat for those who see this season’s monster hurricanes as evidence that Giant Weather Machines (GWM) are controlling the behavior of the atmosphere now. “Hurricanes now develop in locations that best suit the weather makers. No longer do they need to spend a week traversing the Tropical Atlantic gathering a name as they first become a depression while slowly strengthening to a tropical storm and then on to become a hurricane. Yes, explosive hurricane development has occurred in the past, but these past few years are different. There has been a discernable shift in how quickly and where these tropical storms develop and mature. Storms now form much closer to where the Powers That Be want the maximum terror effect. These storms are clearly government sponsored terrorist events. The effects are economic, are emotionally draining to the point of exhaustion, certainly financially taxing, and used to cause a victimhood mentality that makes us all feel powerless in some sense. The net effect is fatigue and in the case of Katrina and Rita we have been delivered an infection of poverty that this deeply indebted nation will struggle to overcome for a generation or more.